Termite Solutions... Saving One Structure at a Time! Each year, all across America, Termites do millions of dollars in damage to many homes and businesses. You don't have to wait for them to do the damage; you can PREVENT it from happening...With Four Seasons Pest Solutions' TERMITE PREVENTION PROGRAM. That's right, PREVENTION! We offer both liquid and bait treatments or both. We use advanced technology for treatments and monitoring. Whether it is prevention or elimination, we have got you covered! We offer great warranties with our treatments, often DOUBLE the life of our competitors and we'll actually KEEP YOU UNDER WARRANTY! We won't forget about you, and we'll be there every year to do an inspection to make sure you are still termite free! consistent results nearly every time. 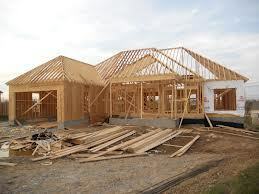 Once a termite has come in contact with or ingested Termidor treated material it becomes a carrier. 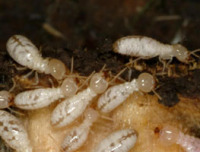 As the infected termites travel to and from the colony through their mud-tubes the transfer effect takes place with other termites. Each termite that comes in contact with a carrier will become a carrier themselves and the process repeats. Termidor works slowly allowing termites to transfer the infection many times before death resulting in many more infected termites which will ultimately lead to colony elimination. The initial death of individual termites is relatively slow, however, colony elimination is typically quick, usually within 90 days. Establishing a Termidor barrier around a structure is performed by first making a trench to specific dimensions around the foundation. In some cases the soil beneath the trench may be rodded and injected with the solution. Once this is completed the trench is filled with the solution as the dirt is replaced. 1/2 inch diameter holes may be drilled into garage, porch, patio and basement concrete to fulfill the perimeter barrier treatment. These holes will be plugged and recovered with a small concrete patch which will blend in quickly in most cases. Four Seasons Pest Solutions Inc. will provide a re-treat contract and a graph of the structure treated at the time of service and explain the treatment technique. The baiting system is monitored by one of our technicians at least three times each year. In terms of cost effectiveness and quality performance, Exterra Termite Interception and Baiting System is a great choice. This system eliminates the need for extensive drilling into existing concrete and is a great GREEN choice for the environmentally conscience. This system will still be performing perfectly long after a liquid treatment has dissipated. These Bait stations are placed approximately three feet from the foundation of the house and every 10-20 feet along the perimeter. In some cases there may be two or three stations placed at or around existing active colonies. The average home will require between ten and twenty stations. BEFORE you pour any concrete. Pre-treats are less expensive than post treatments and much more effective. 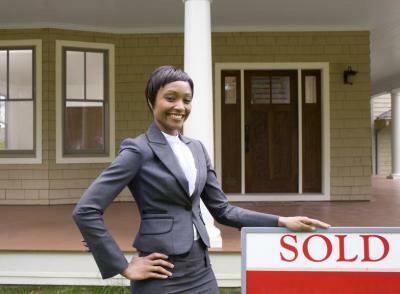 We offer WDI reports for Real estate inspections at very affordable prices. Whether: HUD, USDA, V.A. very competitive WDI Report pricing and can usually get to them very quickly. detailed treatment quote if wood destroying insects are found. About mid February of every year, termite season begins in our region. 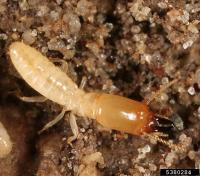 Depending upon the weather, termites may begin swarming slightly at this time. 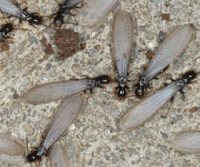 By May to mid-June, termite swarmers can be at the height of swarm season. By this time it isn't uncommon to find them or their shed wings on your vehicle, in your window sills both inside and outside, in spider webs and many other places. Seeing termite swarms or their shed wings is a strong indication that you have an infestation. However, just because you don't see them does not mean you don't have them. Get a free termite inspection and know for sure. Your home is too valuable to let termites destroy it. 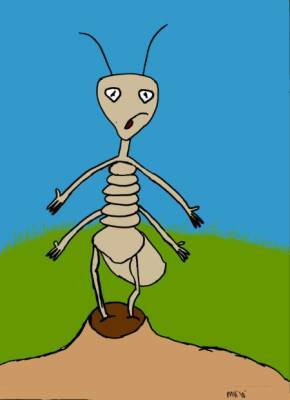 Tommy Termite is disappointed that Four Seasons Pest Solutions' thourough treatment plans have blocked him from feeding on your home!